Tinware was not intended to reach “antique” status. Objects that were used steadily became scratched, dented, faded, and rusted. The material was vulnerable and disposable and cost less than ceramic items with same function. This oval teapot and the conical chocolate/coffeepot show evidence of honest, aged surfaces. 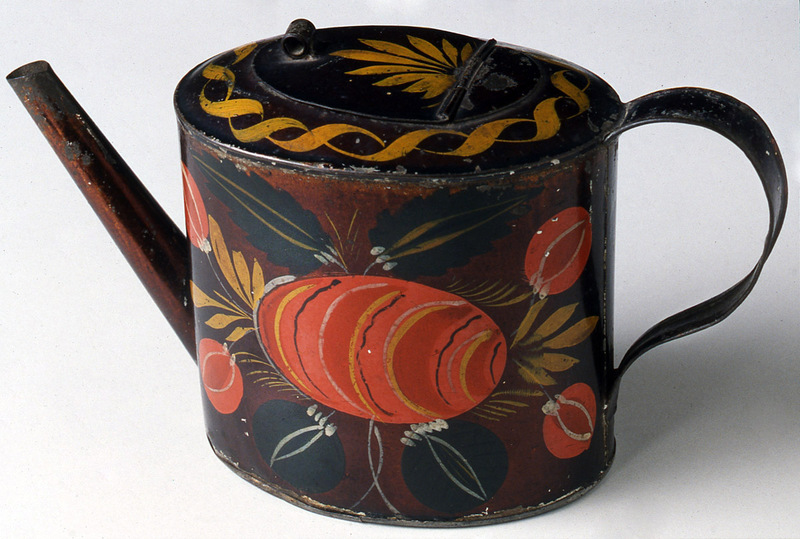 Teapot, made in New York or Connecticut, 1800-50. Detail showing “alligatoring” in the paint. Notice the how the asphaltum varnish has darkened and chipped off along the edges and heavily-abraded areas like the inside of the handle. See the darkening oil paints, lost highlights, and the nearly invisible green leaves. 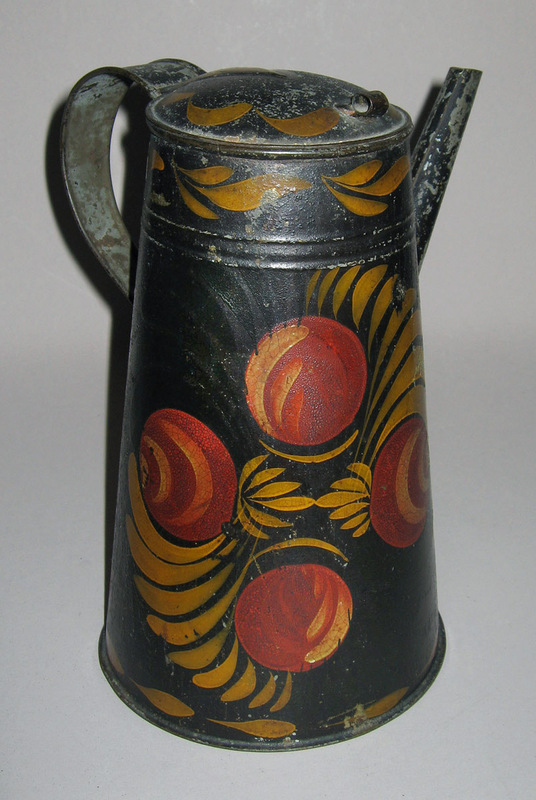 Painted surfaces on metals often dry and crack into a bumpy texture called “alligatoring,” like those you can see in the detail of the chocolate pot. Frequent handling of these delicate surfaces results in tiny crumbling losses of varnish and larger areas of paint popping off. At the museum, we touch painted tinware as little as possible and only when wearing nitrile gloves. 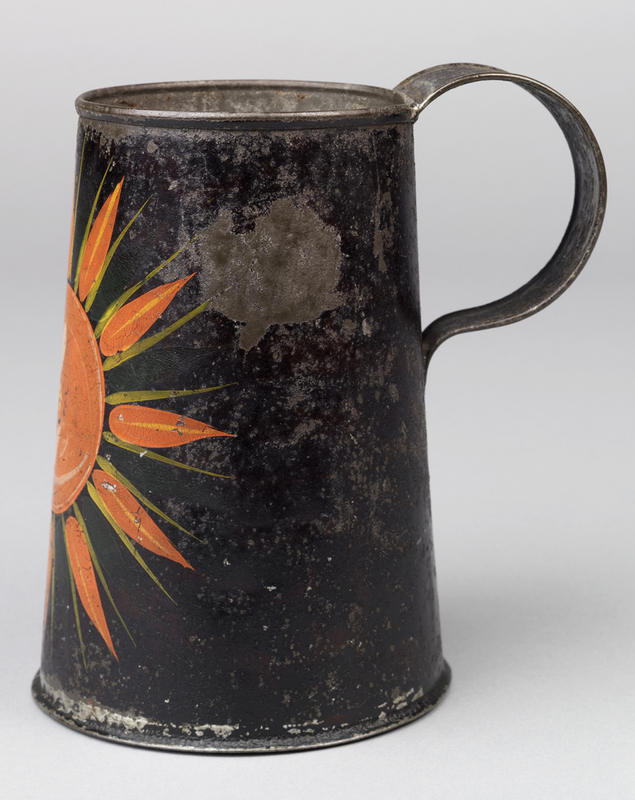 At first glance, the surface condition of this mug (left) with a central red flower seems good, but careful visual examination indicates that the black ground once had a more prominent amber hue. 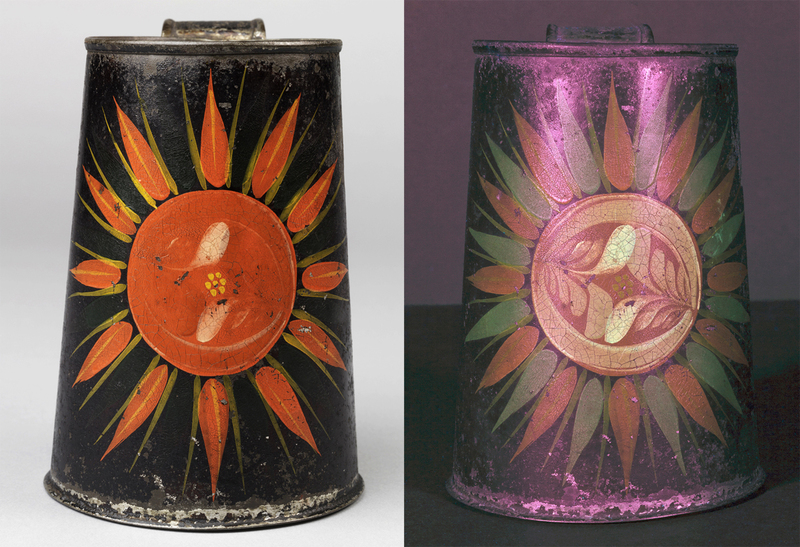 Looking even closer, Winterthur’s conservators used long- and shortwave ultraviolet light (see photo, right) and discovered details in the red and green floral ornament that are nearly transparent under normal light. The process revealed that layers of color were added by the decorator to give highlighting or shading effects. 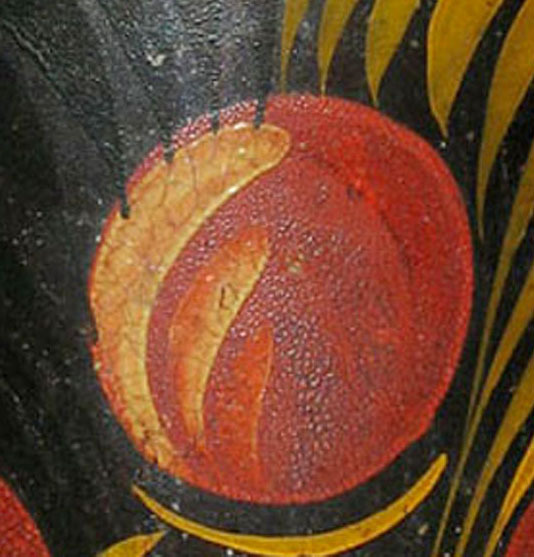 Compare both images at the center circle and the surrounding leaves to see pigments that have now become almost invisible due to light exposure from the time it was decorated nearly 150 years ago. Collectors who love antique tinware learn to treasure objects with honest signs of aging. This mug is also missing a large area of varnish to the left side of the handle. Instead of detracting from its appeal, we note this as a clue that the mug was most commonly held by right-handed people whose thumbs have worn off the surface coating.